Lawyers, especially those defending clients who are almost certainly guilty of serious crimes, tend to get a bad rap both in real life and in the movies. But in the first section of BRIDGE OF SPIES, director Steven Spielberg and screenwriters Matt Charman and Joel and Ethan Coen present what amounts to a defense of the oft maligned defense attorney. Played by Tom Hanks in full on Jimmy Stewart mode so you know he’s a good guy, insurance attorney James B. Donavan doesn’t really want to defend accused Russian spy Rudolf Abel (Mark Rylance). He’s convinced, however, that it’s his patriotic duty to do so, so as to insure that the Soviet Union and the world at large can see that even a Russian spy caught at the height of cold war paranoia is still given a competent and vigorous defense in a court of law. But not too competent and vigorous. Donavan comes to like his client despite himself, though, and winds up doing a better job than he had initially planned on. He raises legitimate legal objections that the judge quickly overturns, but which set up a possible appeal. After the eventual, expected conviction, Donavan more convincingly argues that imprisonment would be a better sentence than the death penalty, if only to insure that potential future American prisoners receive similar treatment, and to have a bargaining chip for a possible swap in such cases. Cooler heads see the wisdom of this path, but when the sentence is announced the general public isn’t so understanding. Not only is Donavan shunned and threatened, his home is shot at, the bullets nearly missing his teenage daughter. Suffice it to say, Donavan’s wife Mary (Amy Ryan) is less than thrilled when her husband tries to get his client’s conviction overturned on appeal. Things eventually settle down for the Donavans, but when a U.S. spy plane gets shot down in Russia and its pilot, Francis Gary Powers (Austin Stowell), is captured, Donavan gets dragged back into the cold war to facilitate a potential exchange of Abel for Powers. Matters become further complicated when Frederic Pryor (Will Rogers), an American studying economics in Germany, is captured trying to leave East Germany just as the wall is going up and convicted of espionage. The CIA only wants Donavan to get Powers back, but Donavan has other plans. 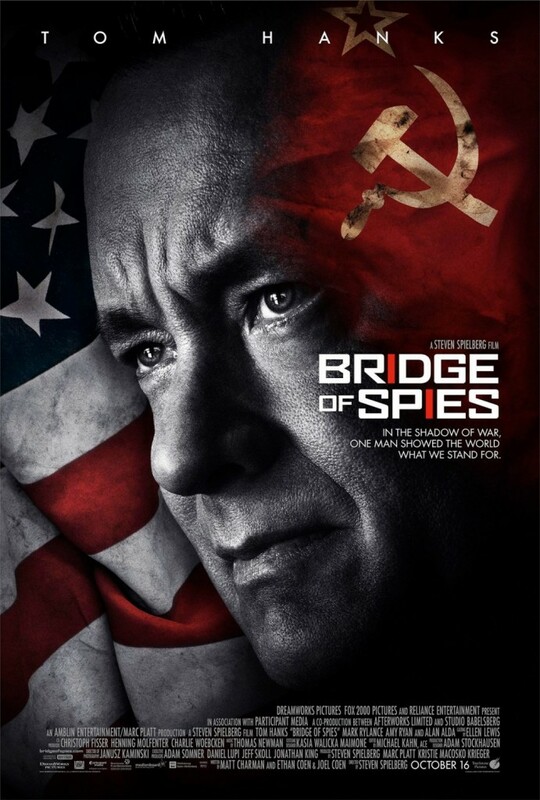 First and foremost, BRIDGE OF SPIES brings to life an important and dramatic chapter in the history of the cold war that doesn’t get mentioned these days nearly as much as the Bay of Pigs or the Cuban missile crisis, but is nonetheless worth knowing about. It also has some relevance for the present in the way it touches upon the importance of treating enemy combatants in a humane manner so that our own citizens will be more likely to receive fair treatment should they become prisoners of war. BRIDGE OF SPIES may not be one of Spielberg’s truly great films, but it is nonetheless a very good one. He tells this tale in classic Hollywood fashion, making sure to throw in some typically Spielbergian touches as well, like the chaotic family dinner at Donavan’s home early in the film. You can also feel the touch of the Coen brothers no strangers to old school Hollywood sensibilities themselves (see THE HUDSUCKER PROXY and O BROTHER WHERE ART THOU?). Their distinctive voice also comes through loud and clear in the dialogue, especially Abel’s. No matter how dire things seem for him, whenever Donavan asks the Russian spy why he isn’t worried, Abel invariably replies, “would it help?” 3 ½ out of 4 stars.